Tapestries are fascinating textiles that contain a wealth of detail in their imagery. 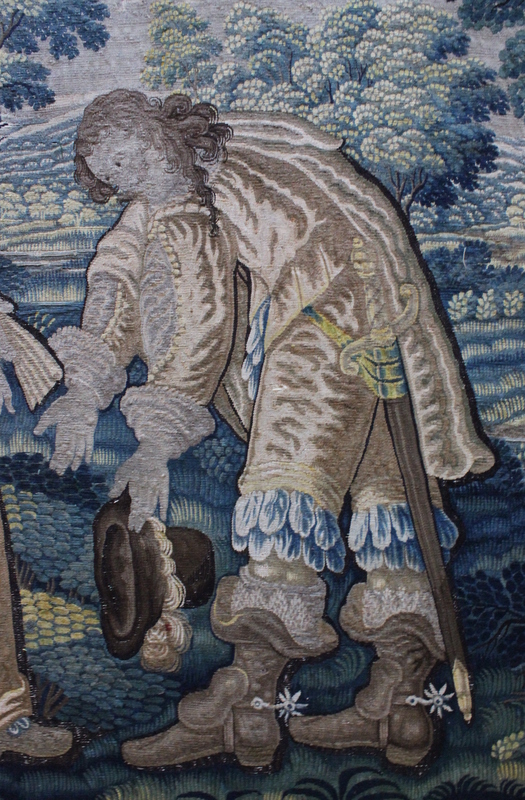 A set of unique tapestries in a Lincolnshire stately home depict seventeenth-century figures and fashion, giving a glimpse into the past and perhaps even helping to more accurately date the tapestries themselves. Doddington Hall is a privately owned Elizabethan hall and estate, which has remained in the same family for over 400 years. The property is home to two sets of tapestries, remarkable in that they have been nailed to the walls since 1762. They have been roughly dated to the 1620s, and so were already over a hundred years old when hung in the eighteenth century – suggesting that appreciation for ‘retro’ furnishings is not such a modern phenomenon! One of these sets, known as the Holly Bedroom tapestries, was recently conserved and returned to the room in 2016. Conservation work removed centuries of soot, rendering the tapestries cleaner and more stable, and bringing colour and clarity back to the imagery. The tapestries show a host of figures set against a backdrop of idyllic rural scenery, including a peddler carrying a wooden chest on his back, a bagpiper playing a tune to a dog dancing on its hind legs, a cobbler making shoes, his tools arrayed on a table beside him, and a well-dressed couple greeting one another, the gentleman doffing his hat with a low bow (as all gentlemen should). Although these are by no means the finest tapestries of their time, they are detailed enough to depict identifiable features such as the shine of a silk satin dress, the open slits of a sleeve and sharp, star-shaped spurs. The costume of the courting couple is most likely to help to date the tapestries; they appear to be wealthy aristocrats who could afford to keep up with the latest trends. The lady wears a dress of yellow silk satin, with a tight-fitting bodice and loose, voluminous sleeves. The cuffs are wide and loose around the arm, ending below the elbow, leaving the forearm and wrist bare. This style is seen in portraits of Queen Henrietta Maria during the early to mid 1630s. The collar falls from neck to shoulder and is secured at the chest with a floral decoration. By the 1630s, ruffs had fallen out of fashion and large lace collars such as this one were being worn by fashionable courtiers. The lady wears low-heeled shoes fastened with a blue ribbon tied in a bow. It wasn’t until the seventeenth century that ribbon and buckle fastenings came into use. In her right hand the lady holds a fan or possibly a pair of gloves, and her hair is shoulder length, loose and curly. Again, this bears similarities with portraits of Queen Henrietta Maria, swept back from the forehead with short curls framing the face. The gentleman wears matching yellow satin doublet and breeches, with a short cloak swept over his shoulder. His collar is not visible but his cuffs appear to be of white lace, and, unlike those of the lady’s dress, are closely-fitting at the wrist. A single slash in each loose sleeve reveals the white shirt beneath – a feature fashionable in the 1630s and into the early 1640s. The breeches end at the knee, and are trimmed with flamboyant blue lace ‘feathers’. He wears heeled boots with spurs and ‘butterflies’ - leather pieces designed to reduce chafing from the spur straps. The boots have a wide ‘bucket-top’ – a style now associated with the Three Musketeers that became fashionable in the 1630s. They are worn with boot hose and trimmed with lace cuffs, as in Anthony van Dyck’s 1638 portrait of the Stuart brothers. In his hand the gentleman holds a dark brown, wide brim hat with ostrich feather decorations. This style became fashionable by the 1630s – before this point the capotain had been the fashionable hat. His hair is also more indicative of 1630s fashion, as long curls were not fashionable until then. He has a long strand of hair over one shoulder; known as a lovelock, this was worn as a symbol of devotion and love. 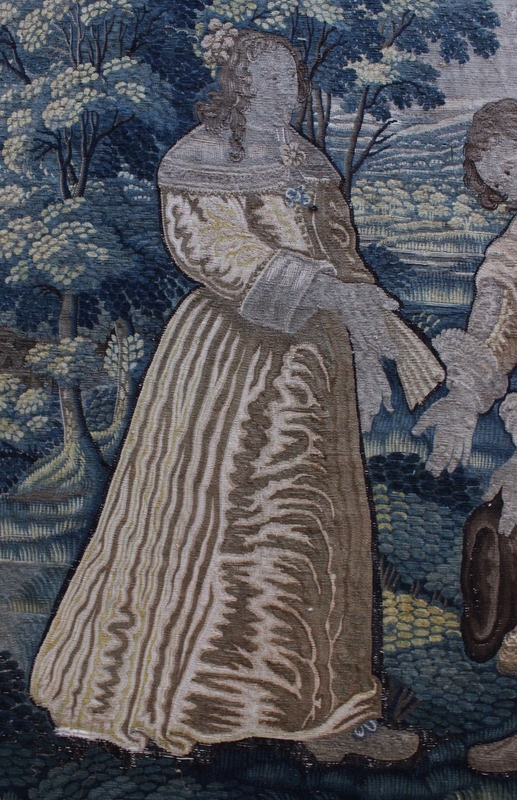 Combined, the clothing of both figures points to a 1630s date for the tapestry’s imagery. Whether or not the Flemish weavers were depicting the very latest European fashion, as portrait painters such as van Dyck were known to do, remains unclear. 1. Ashelford, Jane. The Art of Dress: Clothes and Society 1500? 1914. Vol. 21. Anova Books, 2009. 2. Arnold, Janet. Patterns of Fashion: the cut and construction of clothes for men and women 1560–1620. Macmillan, 1986. 3. North, Susan, and Jenny Tiramani, eds. Seventeenth-century Women's Dress Patterns. V & A Pub., 2011.